It was freezing! The first snow of the year fell just enough for Ryan Jr. to catch one on his tongue. He was so excited. Snow=Winter and Winter=Christmas and Christmas=more Legos! On our walk to Starbucks, for our father-son date, we said “Hi” to a “new friend” asking for money at the traffic light. We had no cash to give, but offered to bring him back a cup of coffee. He seemed genuinely grateful. As we handed the homeless gentleman his hot coffee, I tried to start a conversation, but he was more interested in returning to his perch between the traffic lanes. I turned to Ryan Jr. and started to say, “Sometimes…” but he cut me off. “I know what you’re gonna say, Dad, but all we can do sometimes, is pray for them.” I was dumbstruck! On the way back home, Ryan Jr. described deep conversations he had with Jesus the night before. As I had spent the previous 24 hours battling a spirit of fear to the point of exhaustion, it was all I could do to keep the lump in my throat at bay. In this world, a six year can only do so much, but in the spiritual world, a six year old with faith in Jesus is unstoppable! P.s. 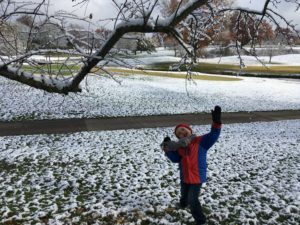 The arrival of snow was another testimony of God’s faithfulness for Ryan Jr. He had been very sad about moving to South Africa and therefore missing the opportunity to see snow this winter (with South Africa being in the Southern Hemisphere)… days before moving overseas, God answered his prayers and blessed him with a few days of a ‘Winter Wonderland’!